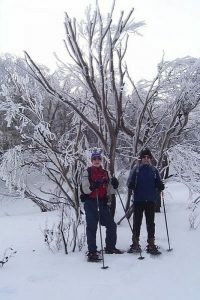 winter months and are usually led by experienced skier Sue Cardwell. The group welcomes newcomers to this exhilarating pastime. To receive emails about trips, which are often organised at short notice, send an email to [email protected] to connect to the BorderSkiers Yahoo website. (This facility is open to BBC members only). There’s nothing quite like setting up camp in the snow and waking in the morning to a pristine landscape just begging to be skied and explored. 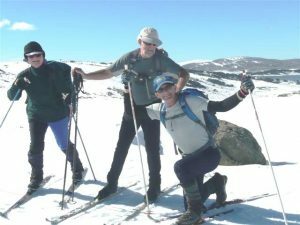 A number of our members lead regular snow camping trips and you’re more than welcome to come along and give it a try if you have overnight bushwalking experience plus some basic ability. 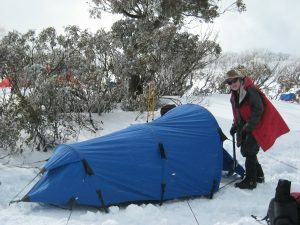 The Club’s snowshoes have proved one of the most popular items of hire equipment and anyone who can walk can snowshoe. What better way to enjoy our fantastic winter wonderland than by a gentle stroll in the snow? Each year we offer downhill skiing as an alternative to the more challenging and physically demanding pursuit of cross country skiing. Night skiing at Falls Creek is becoming increasingly popular amongst members and it doesn’t cost an arm and a leg. A few of our members are right into snow boarding – an activity falsely believed to be the exclusive domain of the young!